Not much of a follower of Football I'm afraid, but I did watch some of the England versus Italy match on Saturday night after an enjoyable performance of Happy Days, at the Grand Theatre in Wolverhampton. It's a shame we didn't win, but I did think we needed far more attack in the second half, rather than kicking the ball backwards all the time. After the theatre I was rather peckish and decided it was appropriate to eat this Brazilian BBQ Steak flavour Pot Noodle. Glancing over the World Cup themed Pot Noodle pot, I could see that this flavour was noodles in a peppered steak flavoured sauce with an added sachet of barbecue sauce. This sounded right up my street as I love peppered steak and I also love barbecues in general. So what could go wrong? I noticed that there was cumin, black pepper and cayenne pepper in the ingredients, as well as smoke flavour in the sachet. I added freshly boiled water, the solid noodles a powder stirred together easily, and then added the smoky barbecue sauce sachet. The mixture had a lovely smoky barbecue beef smell to it. After cooling the taste had a smoky barbecue beef flavour with a peppery kick and a blend of cumin and parsley. I suspect the diced green bits amongst the sauce and noodles were the parsley. This pot noodle had a medium spicy chilli heat to it and bunches of flavour. 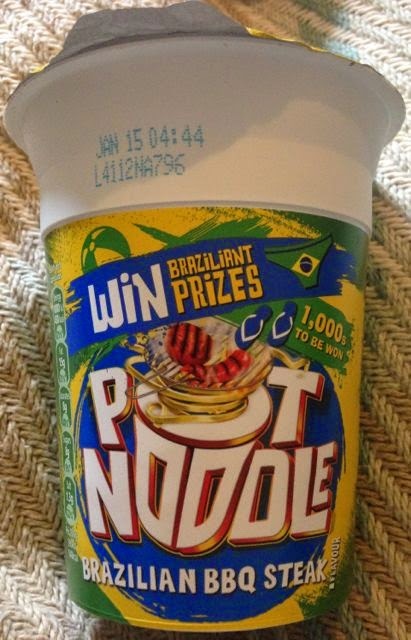 Over the years Pot Noodles have definitely increased the quality of their flavours, and this Brazilian BBQ Steak flavour Pot Noodle was certainly no exception. I hope it stays as a flavour for the future as it would be a shame just to keep it as a limited flavour for the World Cup. Whatever team you support or don't support I'd recommend you try one of these Pot Noodles with some bread to dip in for a quick and tasty snack whilst you stick your feet up and watch the Footy on the box! 90g pot has 430 calories, with 15g of fat and 8g of sugar. No artificial colours or preservatives. 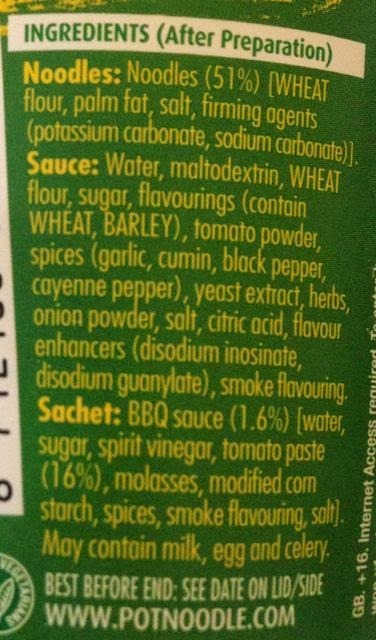 Ingredients see photograph.